Generate some early buzz! 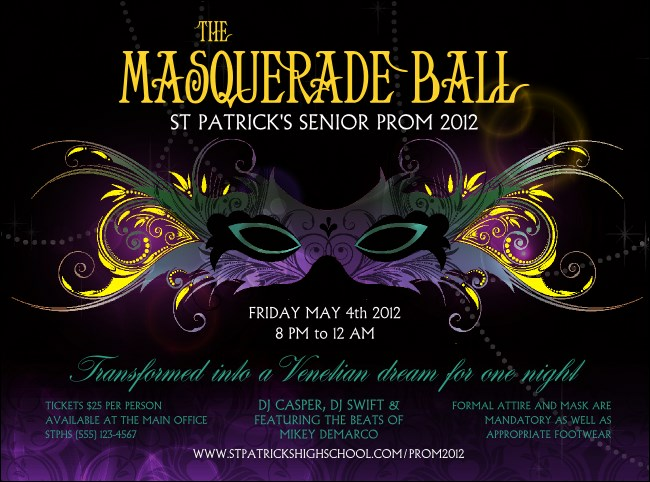 Masquerade Ball Flyers will get the crowd talking about fancy dresses and what mask to wear with them . Post these Flyers in advance and you’ll have no trouble packing the ballroom full of excited guests. Each Flyer features an intricate mask with bright feathers and almond-shaped eyes on a decorative dark purple background. Mystify your guests with great event advertising from TicketPrinting.com.